Ben is a native Vermonter having grown up in Springfield and on the family farm in Chester, Vermont. Ben developed a deep appreciation for the natural beauty of our state. 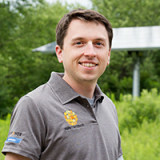 At Plymouth State University, Ben received his Bachelor’s degree in 2012 and Master’s degree in 2014 both in Environmental Science and Policy. While pursuing his Bachelor’s degree, Ben gained experience organizing environmental campaigns as an Intern at Greenpeace USA in Washington, D.C. Ben also served as the student director of Plymouth State University’s “Ecohouse” which serves as a “living laboratory” showcasing sustainable living and renewable energy solutions. Ben’s passions for creating positive social change brought him to SunCommon. In his free time he enjoys telemark skiing, hiking and swimming in Vermont’s beautiful lakes and rivers.